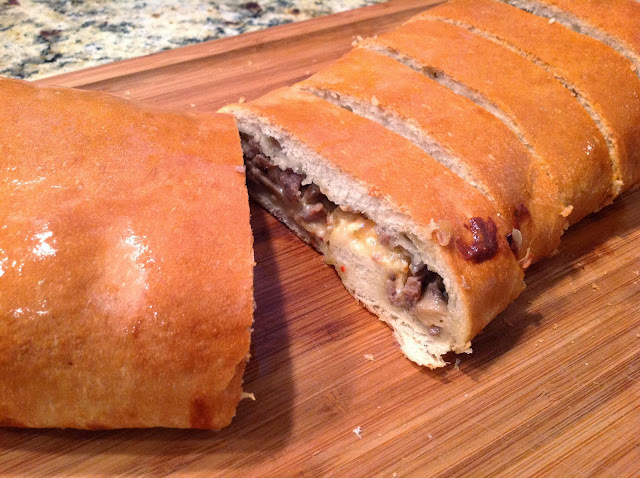 I've been making this sausage bread every Christmas morning as long as I can remember because it's my son, Michael's favorite. I only make it once a year so to keep it special for our Christmas morning breakfast which consist of this sausage bread, an egg bake, fruit and muffins. Every year I think, I really need to take a picture of this bread so I can blog the recipe. Well, year after year, I get busy and forget! But this year I remembered because my son asked for the recipe. I guess he'd like it more than once a year! 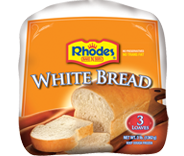 I don't make homemade dough because this Rhodes bread dough is easy and come Christmas morning I need easy! The only hard part to this recipe is remembering to take the dough out of the freezer the night before to thaw. Last year, I forgot, and let me tell you I had to scramble to make homemade dough and it was good BUT it wasn't easy. This recipe makes two of these loaves but can easily be halved if you only need one. 3. Spray 2 cookie sheets lightly with non-stick cooking spray. Roll (shape) each loaf into a rectangle. Cover with plastic wrap and let rest 15 minutes. 4. 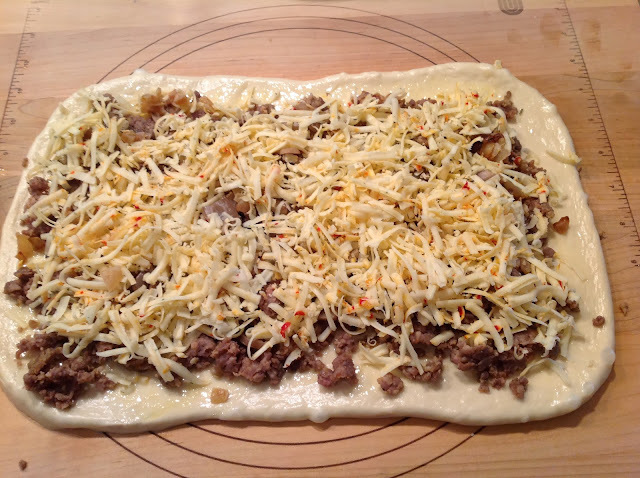 Remove wrap from dough and top sausage mixture evenly over each rectangle. Top evenly with cheese. 5. Roll each rectangle, jelly roll style, starting with the long side. Pinch ends together to seal tucking ends under. Place on baking sheet seam side down. Bake each on their own baking sheet so that each loaf bakes evenly. Switch pans half way between baking time. Bake at 350°F 45-55 minutes. When loaves come out of the oven spread the top with butter. Remove from pan to cool10 minutes before slicing. My mother in law makes something very similar to this and it is a family favorite.